Last time we emphasized a part of the redemption process that is far too often overlooked by Christendom - the necessary freewill choice to embrace restoration. When discussing this topic, the element of payment is almost always the most emphasized part of the definition. Because we are certain that Jesus' blood has the power to cover sin, we tend to assume that His payment and our restoration are the same thing. Grace is misunderstood and the second area of redemption's definition takes on an assumed confirmation. 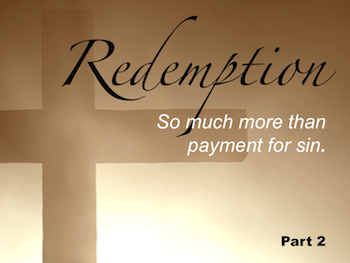 From the story of Hosea and Gomer we discover that God's vivid illustration of redemption goes far beyond just paying the price. In fact, without Gomer's freewill choice to accept her husband's invitation for fidelity, Gomer's redemption would not have been complete. In this study, we want to examine the first of three beautiful facets within the redemption invitation. From Hosea 3:2-5, we learn three things about Hosea's invitation to Gomer, God's invitation to Israel and, by implication of Divine consistency, we can also understand a lot about Jesus' invitation to us. For the children of Israel shall abide many days without king or prince, without sacrifice or sacred pillar, without ephod or teraphim. 5 Afterward the children of Israel shall return and seek the Lord their God and David their king. They shall fear the Lord and His goodness in the latter days." To fully embrace redemption, we must fully embrace intention. The reason for payment is not just ownership, it is also intended to result in cleansing and, thereby, bring full restoration of relationship. When we turn to the church age, we find that the same intent governs Christ's redemptive offer. Jesus wants more than just a claim to ownership, He also wants us to accept His cleansing. Our intention within redemption is just as important as His intention. It's one thing to be re-owned, it's quite another to be restored. Application: I've often heard people say, "It really doesn't matter why a person is baptized as long as they do it to obey Jesus." While obedience is most definitely an admirable step, it is not the entirety of the redemption process. Intending to meet His intention is also essential. 9 And in vain they worship Me....'"
Notice again that conclusion, "...in vain they worship Me...." Obedience is not enough. The intention of the heart is also essential. Clearly, these people were drawing near with obedient lip service. It was the intent of their heart that prompted the Lord's condemnation. Notice another example of obedience without proper intent. The church at Corinth struggled with many things. One of them was keeping the Divine intent of communion. Their communion service had taken on many of the casual traits of a daily meal and, as a result, Paul had to strongly rebuke them for their obedience without proper intent. "Therefore whoever eats this bread or drinks this cup of the Lord in an unworthy manner will be guilty of the body and blood of the Lord. 28 But let a man examine himself, and so let him eat of the bread and drink of the cup. 29 For he who eats and drinks in an unworthy manner eats and drinks judgment to himself, not discerning the Lord's body." The church at Corinth was obediently complying with the Lord's instructions, "do this," but they were overlooking His intent, "in remembrance of me." (I Corinthians 11:24, NKJV) As a result, Paul told them they were risking "damnation" (11:29, KJV) for not having the intentions that match the Lord's intentions. Q: Does it matter why a person is baptized as long as they are doing it to be obedient? A: If worship is vain and communion damnable without proper intent, I would suggest that baptism is also incomplete and without saving power when a person's intention does not match the intention of the Lord. Notice again the very first invitation of the very first sermon on the very first day of the church. Q: What is the Lord's intention for baptism? A: He intended it be done "for the forgiveness of sins." When baptism occurs for any reason other than "for the forgiveness of sins," it risks being a vain response to the payment Jesus made with His blood. Baptism must not be accepted as an outward sign of an inward grace or as a public relations event designed to add a person to the membership roll of a local congregation. Baptism must be done for the express purpose of removing sin. (Acts 2:38) Our intention must match the intention of the Lord. The first and, perhaps, most beautiful aspect of redemption's invitation is the intent of both the giver and the receiver. The offer Hosea made to Gomer was predicated on the intention that He would once again be her husband and she would accept his redemption through fidelity to their relationship. (See Hosea 3:3.) We must do the same. The payment has been made. The payment is enough. It's not the payment that is in question. Our response to Christ's offer for cleansing is the only variable. We must be baptized "for the forgiveness of sins." Intent is essential. We must make it real! Redemption - Part 3: "Dimension"